What if you could find out how much your things are worth quickly and easily? Verbal appraisals – at whatever location you choose within Edmonton, St. Albert or Sherwood Park, Alberta. Expert written appraisals (where required) for insurance purposes, divorce settlements, donations and bequests, and estate settlement. 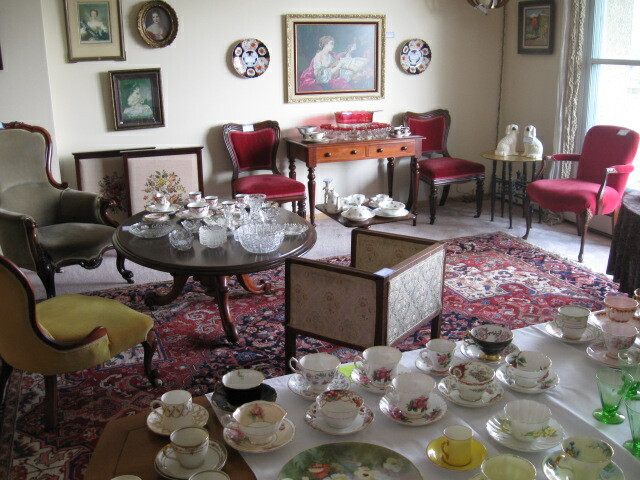 Occasionally, when the number of items for dispersal is significant, at the client’s request, I can organize a private sale where I invite my private list of collectors, antique dealers and interior designers who are always on the lookout for antiques and collectibles. This private sale could be in the privacy and comfort of your own home. I have organized sales in condos, private homes, storage facilities, and even back yards. My experience in displaying antiques and marketing them ensures success. In 1994 I opened an antique store called “From Times Past.” Since its closure in 2007 I’ve continued to be involved by appraising teacups to teak furniture (and everything in between). I teach the history of art and the history of furniture for the University of Alberta’s certificate programs and speak throughout the city on topics pertaining to antiques. I am also a certified member of the Canadian Personal Property Appraisals Group (CPPAG.com) so you can rest assured that any written or verbal appraisals you require are done in a professional manner. Depending on your individual situation you will likely relate one of the following scenarios… or at least that’s what my many years of experience in doing antique appraisals in Edmonton has taught me. 1. You or someone in your family is downsizing to a smaller place and you need to choose the pieces to take with you. Knowing what something is really worth will help you make informed decisions instead of guessing what things are worth and regretting them later when you find out you made a big mistake. 2. You or someone in your family is moving to a seniors’ facility and everything, except the basics, needs to be sold. Dealers love these situations because they make the most money on complete estates. Why shouldn’t you get as much as you can for the things that have the greatest value? Make sure you’re not getting ripped off and get a professional appraisal before it’s too late. 3. You or someone in your family is splitting the estate now and want to be fair in giving beneficiaries equal shares. Without knowing the value of items it’s easy for the beneficiaries to be upset with you if one of them inherited something worth $50 and another got something valued at $500? This potentially ugly situation is easy to avoid with an unbiased appraisal. 4. You are tired of your collections and decide it’s time to de-clutter your life and space and sell… but you need help to price your pieces at a fair market value. Going from shop to shop trying to find out how much you can get is not only a waste of time, but if you don’t know who pays top dollar you could get far less than you deserve. 5. You are the executor of an estate and it is your job to get a price for the goods in question or your lawyer wants you to get an appraisal for legal purposes. As an executor you are legally responsible for enough already – why should you have to do this too? I can help you. 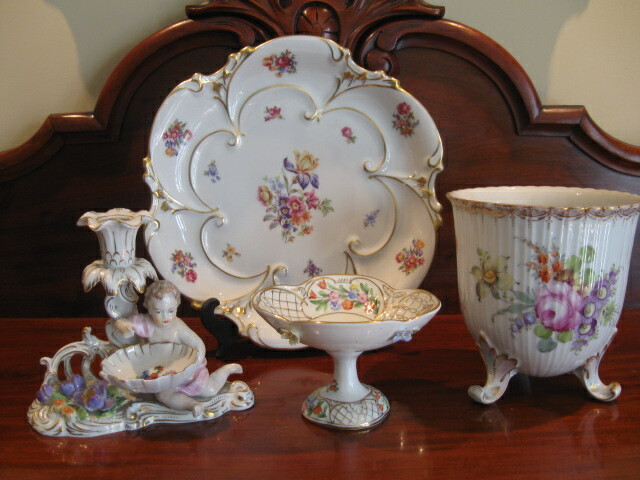 Decorative porcelains – Are they valuable or not? 6. You or someone in your family has inherited several items from a relative and you want to know what the pieces are worth. Once you know then you can sell them for a fair price and make sure no one is taking advantage of you or at least rest easy knowing what you’ve really got. 7. 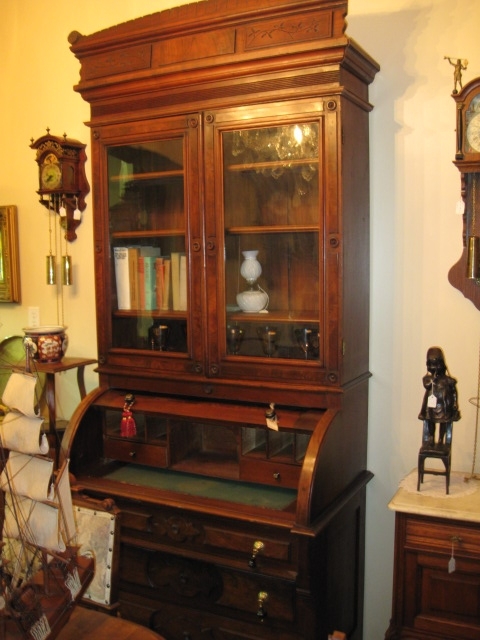 You want to have a sale but don’t have the foggiest idea of how to charge for your antiques. It’s easy to end up pricing too high or too low. In either case you could end up with a lot of junk left over – even after all that work of setting up the sale. 8. You have a general idea of the value of your things but now you have to find motivated buyers – and you sure don’t find them by having a garage sale. What you need is someone who is willing to buy and pay a fair price for your pieces. Helping you identify who you might contact to sell your items is a standard part of my services. Appraisals are charged on a per hour basis with a two hour minimum for your first appraisal. All other services like a private sale are either by the hour, by commission or a combination of both. A fair market value appraisal will give you a good idea of what you might expect your items sell for in the current market. It is the most common appraisal. A seller’s appraisal will give you a wholesale price range for any items you might sell to a dealer, an auction house or other secondary buyer. A replacement cost appraisal gives your insurance company an idea of what it would cost to replace the items in the case of damage or loss. A forced sale or liquidation appraisal would give an idea of what you might get for an item if faced with this situation. Call me now at 780 722 7494 to explore if taking advantage of my expertise makes sense for you or email me now by clicking on this link: I would like more information about your appraisal services.